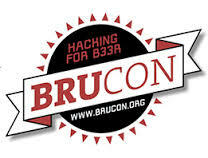 Here are my quick notes from the BruCON 2015 conference. All the slides can be found here. The malware is just code so, as any other code it is possible (in theory) to analyze/reverse engineer it manually. is the input malicious ? if yes, what is exploiting ? some tools for passive analysis: VirusTotal, BlueCoat Web Pulse, PassiveTotal.org (crowdsouce intelligence about the domains and/or the urls), the “classic” whois. some malware could profile your browser, check the browser version, platform, or use the user agent script to decide if the exploit can be executed or not. some tools:useragentstring.com (to check your user agent), onlinecurl.com (on-line version of curl, copy paste a url and you get back the response), hurl.it (idem as previous one). use jsBeautify.org to try to have something human readable in case the code is obfuscated. use ideone.com to de-obfuscate the exploit. can submit the file/s to VirusTotal or malwr (virtualized Cuckoo instances). malwr can give you infos about the registry keys created, network traffic. build IOCs (Indication Of Compromise). collection of indicators which can be used to describe a compromised system.